Debbie & Andrews Sausage KebabsQuick, easy and super tasty sausage kebabs! The classic combination of creativity and convenience…these things pretty much make themselves! As far as easy BBQ recipes go, you’d be hard-pressed to find any that demand as little input as this! Nevertheless, whip up a batch of Debbie & Andrew’s Sausage Kebabs at home and you’ll see for yourself what a crowd-pleaser they really are. The fact that they take easy and cheap BBQ ideas to another level is simply an added bonus! Chop the sausages into pieces around the same size as the cherry tomatoes, rolling the streaky bacon slices up to around the same size. 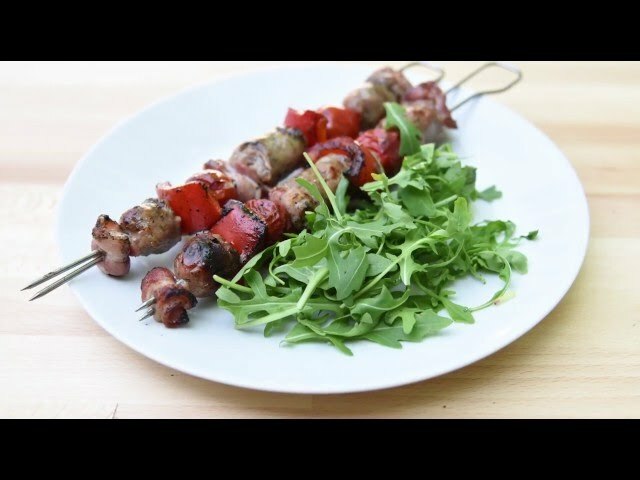 Use metal skewers to create the kebabs, first adding bacon, then sausage, then cherry tomato then red pepper. Repeat until the skewer is full. Place over a hot barbecue and cook for around 15-20 minutes, turning regularly to avoid sticking or burning. Serve with a side salad or corn on the cob – a guaranteed hit with adults and kids of all ages!